Several young children, elderly people and members with respiratory conditions were brought to Wauzhushk Onigum Nation last week to escape smokey conditions. Residents of Wabaseemoong First Nation who had left the community due to poor air quality caused by Kenora forest fire 71 are now heading home. Air quality in the area has improved since last week, when young children, the elderly and members with respiratory conditions were brought to Wauzhushk Onigum Nation to escape smokey conditions, according to the Ministry of Natural Resources and Forestry. 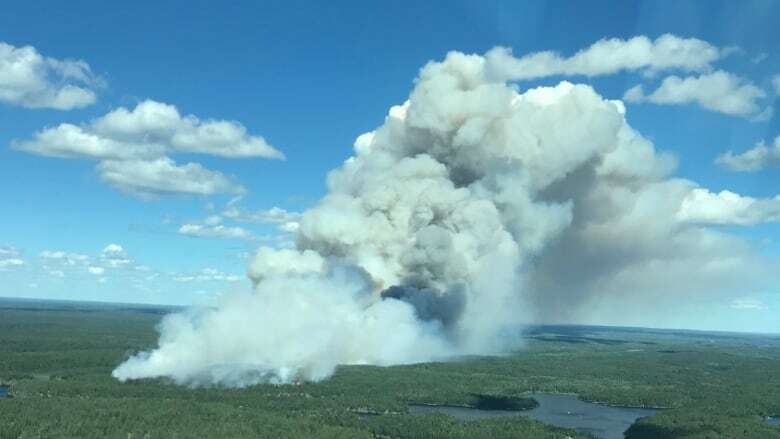 Smoke from forest fire near Kenora, Ont., prompts evacuation of Wabaseemoong F.N. 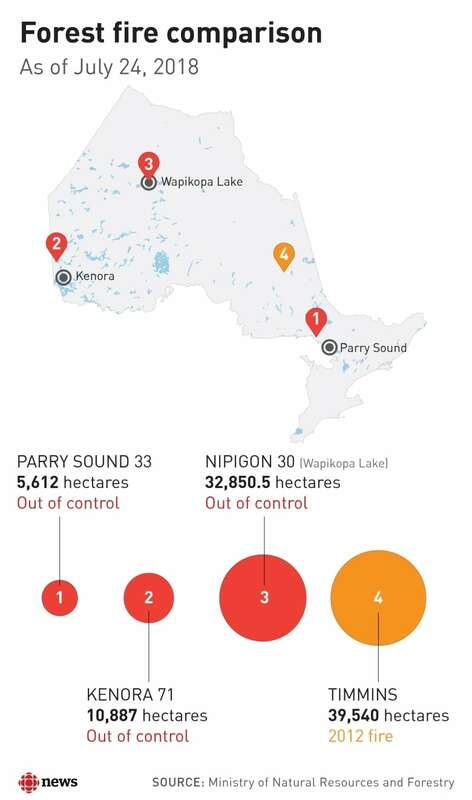 Kenora 71 is still listed as out of control, said fire information officer Jonathan Scott, but crews have finished performing aerial ignition—burning away strips of forest to eliminate fuel and stop a fire from spreading—on the north east side. Crews are still hosing down the perimeter of the fire elsewhere, he said. A hundred and sixty fire fighters are now working on the blaze, he added. The area received rain over the past two days, which reduced the fire's behaviour, Scott said. Several new forest fires have sparked in the northwest region since Monday night, mostly due to lightning, he said, but all are under half a hectare in size. ​A total of 76 fires are currently burning across the region. The fire hazard in the region is currently low to moderate in the western portions and moderate to high in the east. Here's how the Kenora 71 fire compares to other active fires right now and the big Timmins 9 fire of 2012.